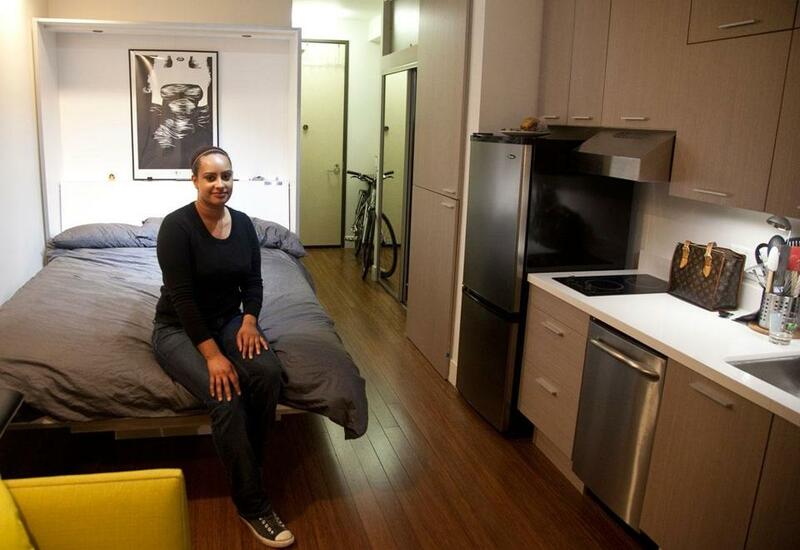 For Terencia Tervalon, home is a 295-square-foot apartment in a 23-unit building in downtown San Francisco. SAN FRANCISCO — The new apartment on Harriet Street is no wider than most hallways: a thin rectangle of space where clutter can quickly cause chaos. At about 10 by 29 feet, the room becomes an obstacle course if so much as a pair of boots are dropped on the floor; at night, multiple chairs must be moved to make way for the fold-down Murphy bed. And because the bed rests on the dining table, failing to clear the dishes has dire consequences. But this 295-square-foot apartment, which comes with more hidden storage and dual-function furniture than a space capsule, appeals to young professionals willing to trade size for the convenience of ­urban living. And in a city with little space to spare, it offers something rare: a downtown location for less than $2,000 a month. Tervalon is the kind of young professional whom San Francisco, Boston, and other growing US cities are struggling to hold on to in an era of skyrocketing housing prices. 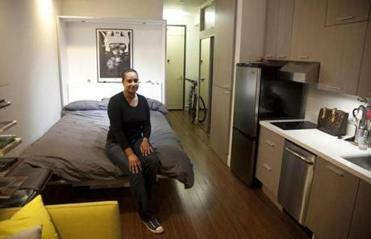 As more people like her elect to live and work in urban downtowns, city officials are experimenting with construction of tiny­ dwelling units known as micro-apartments, in the process triggering a housing debate that is ricocheting around the country. Read: Discuss: Could you live in a micro-unit? On Monday, Mayor Thomas M. Menino of Boston announced a plan to add 30,000 housing units by 2020, saying the city must accelerate its housing production to meet the needs of young workers, middle-class families, and seniors. Development of such small apartments is being promoted as part of the solution to the housing shortage in Boston and other cities. But there is unease among public officials about allowing real estate developers to flood the market with such units, out of fear they will become the modern equivalent of 19th century tenements. And with rents of $1,600 or more, many question their affordability and the willingness of people to pay big to live so small. Even in San Francisco, officials have for now decided to cap the number of market-priced micro-units at 375, mainly because of concerns the city is skewing housing policy to help young professionals at the expense of families. So far, the city is allowing developers to build units as small as 220 square feet, or about 25 percent smaller than Tervalon’s little apartment on Harriet Street. In Boston, officials are also cautious. They have established a minimum of 350 square feet for micro-units and so far limit them to the developing South Boston Innovation District. In particular, Shen said, he wants to make sure that micro-apartment complexes have enough common spaces, such as lounges, to allow residents to stretch out beyond the confines of their tiny apartments. At 38 Harriet St., a four-story building in San Francisco’s fast-growing South of Market District, each unit has nine-foot ceilings and a bank of windows that fill the room with natural light. Space is tight, but every square foot is packed with conveniences. The sofa and refrigerator are full size; a combination washer-dryer is hidden in a cabinet. And although there isn’t a regular stove, the microwave (also hidden in a cabinet) has a convection feature for roasting a duck or baking a pie. Out back is a large patio framed by 10-foot bamboo plants. “We wanted to use beautiful finishes and high design, and make the units as small as possible without sacrificing too many of the things that people demand of an apartment,” said the project’s developer, Patrick Kennedy, 59, who founded a company called SmartSpace to create the ideal model. Kennedy, a graduate of the Massachusetts Institute of Technology, said it took years of trial and error to arrive at the right design. In 2009, he built a prototype that squeezed the apartment to 166 square feet but found the unit riddled with problems: A stovetop that pulled out in a drawer was a fire hazard; there was no room for guests; the bathroom was a disaster, with the toilet essentially inside the shower, resulting in an uncomfortable intermingling of the room’s key functions. The 38 Harriet units are almost twice as big as that prototype, with a larger bathroom that contains an extra-deep tub. The California College of the Arts has agreed to lease all the units for its students, and Kennedy is planning his second project: an 11-story building with 160 apartments, a communal roof deck, and a ground-floor cafe. The complex will feature similar micro-units, as well as compact three-bedrooms that can fit up to five twin beds. The South of Market District where both projects are located is a rapidly changing corner of San Francisco. Its rundown industrial buildings are being replaced with swanky apartments and cafes serving $4 cups of coffee. Twitter recently opened an office in the district, and several other technology firms followed. Several young residents in the area said that they hope the micro-apartments will help moderate rapidly rising rents. John Espey, an aspiring sculptor who makes a living doing videography, said he is splitting a 3,500-square-foot loft with 13 other people; for a single 120-square-foot room, he pays $500 a month. Stories abound in the city about torturous housing searches that end with tiny apartments at high rents. “Finding a place is extremely difficult,” said Timothy Hyde, a mechanical engineer who moved to San Francisco in June from Atlanta. The open houses that he and his wife attended were so crowded, the competition for any apartment so fierce, that tenants had to be ready to make an offer — and provide a deposit and credit scores — on the spot. Eventually, they settled on a 600-square-foot apartment for $1,950. San Francisco’s mayor, Edwin M. Lee, said the city is experiencing a growth spurt that could increase its population another 150,000 over the next several decades. To prepare, he said, the city must explore different kinds of housing and build denser complexes around transit stops to get residents out of their cars. In Boston, officials are also under pressure to allow smaller apartments. Although zoning rules vary around the city, new housing units are generally required to be no smaller than 450 square feet. Richard Taylor, director of Suffolk University’s Center for Real Estate, said Boston risks losing talented young people — and the next Facebook or other breakthrough business — if it fails to build more housing. For example, Taylor said, the city could work with the MBTA to solicit proposals to build micro-housing on one of many state-owned parcels near transit hubs in the city. Such a project would help prove there is a market for smaller units, making it easier for developers to obtain financing. On Tuesday morning, Suffolk University will host a forum in the Modern Theater to discuss opportunities to build micro-housing around the city. Shen, the Boston city planner who serves as an influential regulator of housing policy, said he is keeping an open mind. For now, Boston will work with Harvard University’s Rappaport Institute to study the impacts of the first batch of the smaller-size units going up in the Innovation District. He also recently met with Patrick Kennedy, the San Francisco developer, to discuss Kennedy’s pitch for a micro-housing complex near the Longwood Medical Area, a neighborhood packed with doctors and medical students looking for convenient housing. Kennedy said he hopes Boston will eventually pursue construction of more micro-apartments. In the meantime, he plans to move forward with construction of his next San Francisco project this summer. 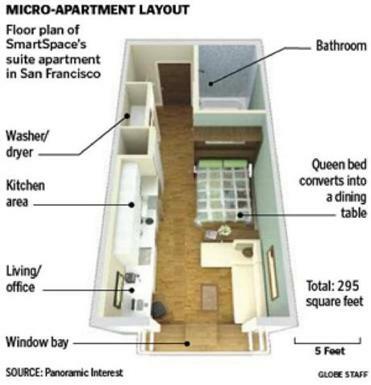 Correction: An earlier version of a photo caption in this story listed the incorrect size of a micro-apartment in San Francisco. It is 295 square feet.